The Canary All-in-One Home Security System has a few unique features not found in other home security cameras. Especially in the way of environmental monitoring. The Canary measures room temperature, humidity and air quality. Temperate and humidity definitions are fairly clear cut. Air quality not so much. This article probes the meaning of an abnormal Canary air quality reading. So what does this have to with Etouffee? This topic came up just last night at about 10:00. My wife got an alert on her phone about abnormal air quality in the living room. You can see the graph that accompanies this article. My wife tends to panic a little too quickly and was preparing for mass evacuation. I then reminded her that I was cooking dinner for tomorrow and she called off the evacuation. You can see it begin to spike again in the afternoon because I was baking these really cool cherry crumb cake bars. So why would cooking or baking raise the air quality indicator to abnormal? Is that normal? Do I have a vent issue or a gas leak? It’s not like the food was burning. Regrettably, Canary air quality doesn’t differentiate from any of the readings to allow determination of the reason for the abnormality. This, to me anyway, is a shortcoming of the Canary All-in-One Home Security System. What is Canary Air Quality? During my ownership and use of the Canary All-in-One Home Security System, I have noticed these spikes before. When I open the door to the garage, it’s not unusual to see the Canary air quality reading spike upwards. Especially if I leave the door open for a few minutes. According to the Canary site, air quality is a measure of changes in pollutants including carbon monoxide, cigarette smoke and host of other contaminants. The Canary isn’t a substitution for a dedicated carbon monoxide or smoke detector (at least not according to their site). Specifically Canary air quality readings measure: Iso-butane, carbon monoxide, hydrogen, ethanol, cigarette smoke, cooking odors. Canary states that air quality is also affected by things like temperature, humidity, and climate changes. Does the Canary air quality show as abnormal every time we cook dinner? Yup. Pretty much. You might say that this negates the usefulness of this monitoring featuring. It doesn’t. When I’m home and see the alert appear, I discount the meaningfulness if we have something in the oven or perhaps just came into the house with a few bags of groceries necessitating the door to be left open for several minutes. However, If I see the alert come about when not at home, there might be something amiss worth checking out. Thankfully, that hasn’t happened yet. Canary will learn what “normal” air quality is for your home in the first 24 hours after it’s set up. Canary recommends making venting your house periodically as the device callibrates itself to learn what’s normal for your house. For whatever it’s worth, I have not done that on a regular basis and generally speaking the Canary air quality stays the same. Canary air quality alerts are useful. I recommend activating them. Click on Settings then Notifications then Home Health Notifications. Options for notifications when air quality is abnormal or very abnormal can be selected. I typically use the abnormal setting but I’m thinking about upping that to the very abnormal setting. Not sure I want to keep getting alerted when we something in the oven. But then again, what’s it take to get a very abnormal reading? Maybe I’ll keep it at abnormal. You can also establish notifications based upon selected ranges for temperature and humidity. I want to be alerted when the temperature exceeds 78 because that means my air conditioner isn’t working right. I also want to be alerted when the temperature drops below 65 as that means my heat might be out. Another real life example occurred a few weeks ago. I woke up in the middle of the night to a cold bedroom. I checked Canary and it said the temperature was 64 degrees and there was an alert on my phone that I didn’t notice because it was 4:00 in the morning and I was asleep. The alert worked. Turns out my boiler went out. Into action I went in trying to light it to no avail. The guy came the next day to replace my thermocouple and it was fixed. I’m now getting the entire boiler replaced because this has happened every year for the past five years or so. Don’t want to get that Canary alert when I’m out of town. Having Canary air quality alerts are useful I don’t rely solely on these to protect us. I rely on a carbon monoxide detector and centrally monitored smoke alarm. I recommend you get a carbon monoxide and smoke detector as well. 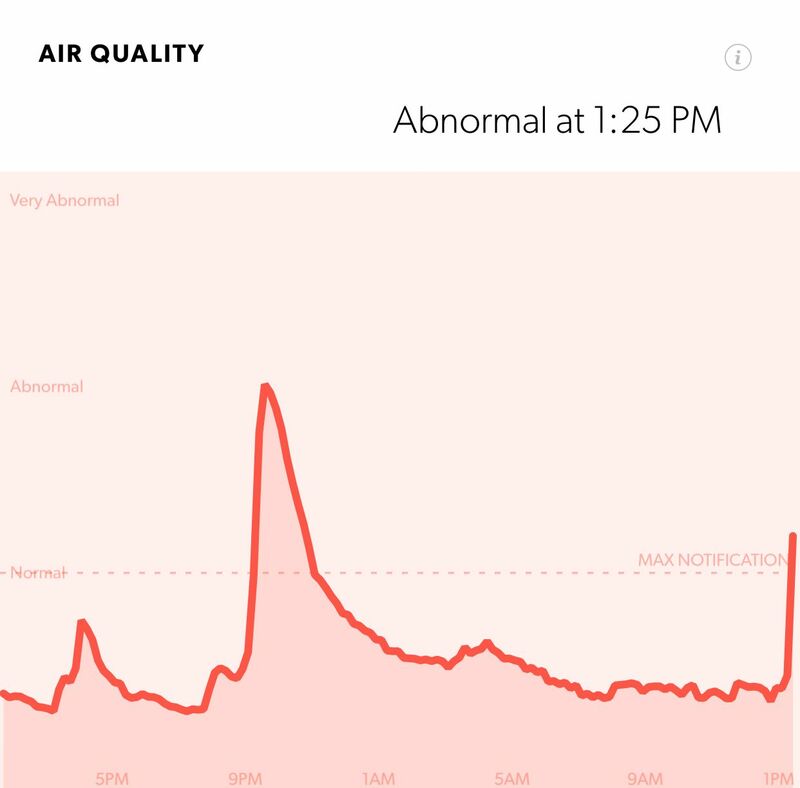 Don’t rely solely on Canary air quality alerts to notify you of a serious issue. Ideally, it would be nice if Canary air quality was broken out by component. It would also be helpful to integrate these alerts into a service such as Wink or IFTTT. This would enable other devices to take action. For example, flash some lights or perhaps sound an alarm when the air quality or temperature alert thresholds are exceeded. I still continue to use my Canary All-in-One Home Security System to monitor the living room of my New Jersey home. It’s an excellent home security camera, the temperature monitoring is very accurate and, in spite or the lack of clarity, provides useful air quality alerts.